Antique varnishing workshop open to professional makers. The varnishing and antiquing method used by Collin Gallahue is a thorough process where each step needs of its own making times. The times required make impossible to fulfill the workshop in one week. All the subjects will be held in two stages, i.e. in two different workshops. In order to get more out of the course and achieve the objectives some work should be done beforehand. 1st Workshop. From wood texture to varnish preparation. Materials needed: White instrument, with the wood textured (both top and back), mechanical antiquing done (edge, corners and scroll worn) and wood oxidized at least two weeks under UV lights. Collin will work on two instruments: One of them white, where he will demonstrate texturing, mechanical wearing, and oxidizing and other one (with all this previous work done) where he will apply the ground and sealer. With this procedure, we can compare it to the work we have done prior to the course thus getting a thorough view of the process. Talks on wood: color and texture. Potential application of oxidants and coloring agents. Talks on wood texture and preparation materials for the ground, varnish composition, its preparation and application for future reference. Talks on set-up, neck setting and instrument design. Materials needed: The instrument will be varnished a couple of weeks before this workshop, so the varnish is not too hard to work on it. 1st Workshop. From 16th to 20th of May 2016. 2nd Workshop. May 2017 ( Days to be determined). 6 hours a day from Monday to Friday. From 09:00 to13:00 and from 15:00 to 17:00h. Registration: The course has been thoght to be done in two workshops. Priority will be for those who enroll for both. But we contemplate the case when someone takes part on the first one and not on the second, so this place on the second one could be filled by a new applicant. Price for the course: The fee for one workshop is: 600 €. For the two workshops: 1000 €. It can be paid in two instalments, before the 1st workshop 600 € and before the 2nd 400 €. Deposit will be done once the place in the workshop is confirmed. Dates and details will be comunicated in due time. Application deadline: 12th April. Admission will be comunicated the 15th of April. 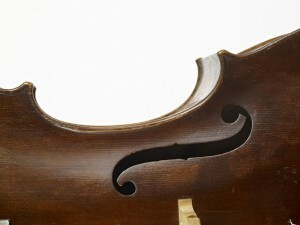 Collin R. Gallahue makes fine violins, violas, and cellos by advanced commission. He was the Workshop Foreman for Samuel Zygmuntowicz from 2008 to 2016 where he worked closely with an international clientele of renowned musicians and studied some of the finest 17th and 18th century Italian instruments. Collin’s instruments have received awards for tone and workmanship including a Gold Medal at the 2014 Violin Society of America competition. He has presented at the Oberlin Violinmakers Workshops and at MondoMusica, New York. He is a member of the American Federation of Violin and Bow Makers.